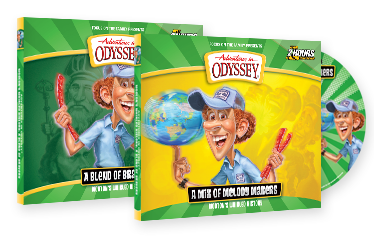 Great news for Adventures in Odyssey fans and collectors everywhere. Wooton’s Whirled History: A Blend of Bravery and Wooton’s Whirled History: A Mix of Melody Makers are now available on both CD and digital download. It’s a summer of history episodes as Wooton introduces each episode with fun facts and friendly banter—served up in Wooton’s unique style, of course!. Wooton is blending up a mix of men of God who made history. From the journey of early church martyr Telemachus and the defiance of Valentine to the amazing prayer lives of George Mueller, William Tyndale, and Charles Finney, you will learn that standing for your faith no matter the circumstances takes amazing bravery. Wooton is at it again! This time, he’s creating a mix of stories about some of the beloved songs of the faith like “Jesus Loves Me” and “It Is Well with My Soul.” Plus, enjoy the retelling of the history of the famous Jubilee Singers of Fisk University. You can pick up your copies of these new releases at your local Christian bookstore or at online retailers.